Bound up and bored? At an impasse or a crossroads? Want to revive a basic lost love in your soul and feel alive again? Go on a treasure hunt! Go to an auction. Discover that one thing you can’t live without, and mingle with others who feel the same way. Relive the suffering that comes with deferred gratification as you paw through collectibles, searching for just the right one. Let your heart pound with greed and jealousy when your rival snatches that right one out of your grasp by being a little quicker, a little richer, and not at the snack bar buying a hotdog the moment your coveted prize was sold. Get excited over compacts, primitives, rusting tools, or composition dolls. Define your passion and search for it. Sit back, have a cup of coffee and a piece of pie, and appreciate the auctioneer while you wait for it – his energy, his ability to multitask, his endless mental price guide, his patience, and his ability to endure a nonstop pace so he can deliver your prize. Applaud him when it’s done, and whether you attain your treasure or not, go home happy. There will be another hunt, another auction, and another auctioneer to make it happen. I love what the artist sees and brings to his canvas, his book, his statue, his photo. He has God’s view, he sees it all, even if he chooses to convey only a portion of what is there. Maybe that’s why artists have such a nice reserve about them. They see things we don’t, share what they’ve divined, and bring us a perspective only an artist’s eye can see. He’s a doorstop, he’s heavy, and he’s sedentary. But he’s moving forward. You can see it on his face. The same look children get in school or in church. The look creative people get when they’ve just finished a masterpiece. The look we all want, even when life calls us to be a doorstop. Keep moving forward, even if it’s only in the mind for now. I’m a detail person by day, in the laboratory where it’s necessary. But in my other life, my real life of writing novels, I create. I can’t be weighed down when a story is churning in my head, with mechanical things or processes that falter or foul up. Those things bog me down, they slow the free-flow thinking process, they turn my novel into something that sounds more like a scientific journal than an engaging slice of life. When I’m in creative mode I expect the details of living to manage themselves. I want my car to start, the washing machine to cycle, my mower to run smoothly – in other words I want the mechanical elements in my life to magically do their job and refrain from distracting my thought flow. So I thank you Henry Ford, Thomas Edison, and Eli Whitney for allowing me to think creatively. Thank you that I can engage with my characters instead of rubbing two sticks together, chasing down the horse to harness it, or tying the goat to another section of my overgrown lawn. And maybe most of all, thank you, Mr. Crapper, for advancing my plumbing to the state of the art it is today. 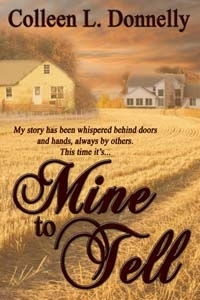 There would be no Annabelle, Julianne, or Kyle from my book, “Mine to Tell” if I was toting chamber pots to the back forty or kicking a tank of water that wasn’t doing what it was supposed to do. Thank you, all other creative geniuses, for allowing me undistracted time to write. I remember when my mom turned an antique hobby into a business, and fun became all business. Instead of letting it sour her, she mastered it. She became the best walking price guide anyone had ever known. If writing is turning into a business for me, then I want to tackle it the way she did her antiques. I love creating a story, I love editing it and working with my publisher and scaling the social media learning curve… And now, instead of doing that with just one book, I’m doing it with three. Mine to Tell, Asked For, and the as yet unnamed beginning of novel number three. It’s a challenge, a new definition of fun, and Lord willing I’ll master it! Artists create and artists evolve! Of course I did! It’s art! It’s someone’s art and I stood at a crowded auction, waiting, until it was mine. I didn’t care for the look on my friend’s face when he asked. It was a smile…no maybe a smirk…but his brows were furrowed like he was confused. I wasn’t confused. I wrapped my arms around my purchase and held on until I got home. Maybe as a writer I appreciate the act of creativity. Could I have carved or whittled this? Never, no matter how much I wish I could. Someone built an expression into this wood. Maybe it’s Paul Bunyan, maybe it’s God, maybe it’s how someone’s great-grandfather looked when raccoons devoured his sweetcorn patch. But it’s art, and I appreciate it. Don’t let the feet propped on the railing fool you. This is phase two of bringing a novel into the world and to fruition – the edits – maybe akin to the last trimester of pregnancy, or the terrible twos, or those teen years where you bang your head against the wall and wonder what you’ve created. Is your art form this way? Do masterpieces spring from you with ease, or is there the occasional C-section? The question of paternity? Or just the exhausted pleasure of knowing you’ve put your all into your progeny and now it’s time to send them forth? The conception of an idea is something I take very seriously. Giving it form and voice and getting it onto my laptop is tedious, but thrilling. Then there is the joyous moment of approval when my publisher says, “Yes!” followed by the knowledge that now the real work begins. Feet on the deck railing. Fine tuning that creation, making it fit for the world while leaving it very much me and my own. Or yours and your own when it’s your art. Go forth and multiply, labor and love. Mother’s Day. A day to express honor, a day to be real, a day to offer your mother and the women in your family the right to be and express who they really are. Thinking ahead to a happy Mother’s Day, for all women everywhere.